I absolutely loved Noah Shaw in the Mara Dyer trilogy. He easily ended up one of my favorite book boyfriends. When I found out he was getting his own books I jumped with excitement. When I got the book, though, I hesitated to read it. What if Noah is no longer the Noah I fell in love with? What if his character is ruined? Finally I caved and started reading it. I had an image of Noah when I started. That image of him was how he was in the Mara Dyer books, and that is not who he is in The Becoming of Noah Shaw. I was ready to give this book two stars because he is so different, but I couldn’t stop reading the book because the story was really good. It was an adjustment getting used to this new Noah, but once I got it out of my head the old Noah I fell in love with I really started to enjoy this book. The Noah Shaw in this book, while still possessing perfect sarcasm, is darker. He questioned his relationship with Mara a lot more than he ever did in the Mara Dyer books. This made me angry and upset at first, but then I was also glad to see him becoming his own person. There were so many secrets in this book too! It kept the story interesting trying to figure out what was going to happen next. On the first page, before the book even begins, there is a list of trigger warnings. I strongly recommend heeding them if you have triggers. 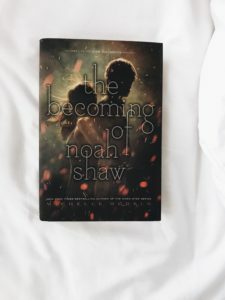 The Becoming of Noah Shaw felt a lot darker and sexier than the Mara Dyer books. All that said, I will definitely be continuing this series, especially with the ending this book had. I received a copy of this book in exchange for an honest review. This does not effect my opinion of the book in any way.